Some of the earliest known works of art are statuettes of women, thousands of years old (the statuettes not the women), showing elaborate hairstyles. Hairstyles are both a display and a means of communication, which can reveal social status and membership of a tribe or group. Think Mohawk of the punk, long-hair of the hippy, short-cropped hair of the soldier and dreadlocks of the Rastafarian. On average there are over 100,000 strands of hair on a young adult. Blondes average about 140,000 strands, brunettes average 108,000 and redheads average 90,000. Hair grows at a rate of about 150 mm a year and each individual strand lasts for two to six years before it falls out, the follicle has a rest for a while then another takes its place. Hair grows quickest in young adult women 16 to 24 years old. 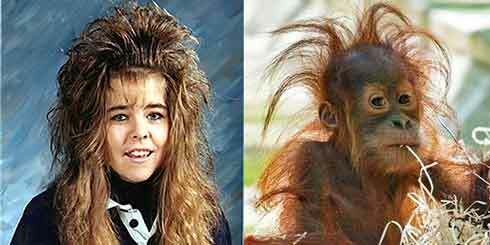 In humans, hair grows thickest mainly on the head. The reason may have to do with the evolution of our upright posture on the hot savannahs of Africa as hair would protect and insulate our head (and brain) from the sun. Hairstyles have a complex meaning and long history. 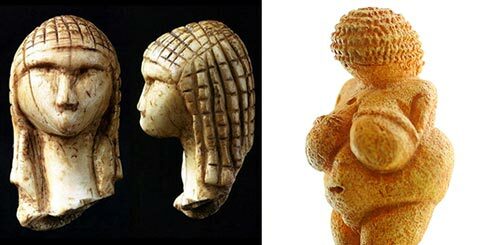 The famous Ice-Age statuettes known as the Venus of Willendorf and of Brassempouy show clear evidence of stylized hair. These statuettes, almost 30,000 years old, reveal a complex social organization and tell us that at least some women in the society took care of their hair. There are also 7,000-year-old small clay figurines from Butmir in Bosnia illustrating short, neatly combed hair. The ancient Egyptians took considerable care in their appearance as well, as the discovery of combs and hairpins in their graves suggest. They believed thick hair was best and used hair extensions and wigs made of real hair or sheep’s wool to achieve this ‘look.’ They also dyed their hair and wigs in a variety of colours with blue, green, blonde and gold being popular choices though black wigs hued by indigo was the favourite. Some cultures consider hairstyles to be a reflection of civilization. Among the Temne of Africa it can take days to fashion a hairstyle. The fine rows of the hairstyle, called ‘cornrows,’ are a symbolic representation of the cultivation of the land, which is indicative of a civilized society. Among the Polynesians, the first time a boy’s hair is cut is one of the ways his coming-of-age is marked. Hair is thought to contain mana or power and so the cutting of hair is also a risky business. To others, hair takes on a much more profound meaning. It represents nature itself and our place in it. Hair grows and dies. If it is not groomed it returns to its natural state—much like an abandoned city reclaimed by the jungle.